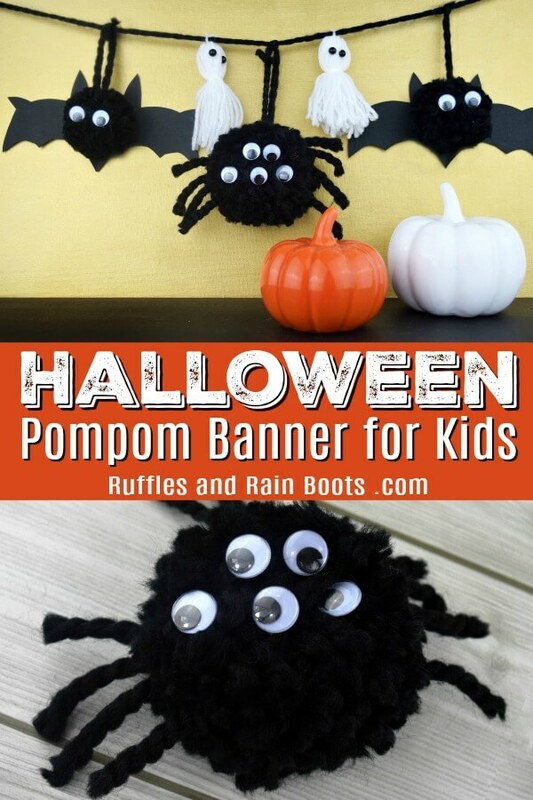 Make this fun Halloween pompom banner with the kids. It has a pompom spider, pompom ghosts, and pompom bats. It’s a great non-scary Halloween decoration. I don’t do much crafting in bed here on Ruffles and Rain Boots, but the other night my daughter had a fun idea to make pompoms. It had been one of those kinds of days, so I suggested crafting in my big bed. You would have thought I’d suggested we drop everything and go to Disneyland! Her face lit up and in seconds she was off, gathering yarn and scissors. We decided to try and make pompom animals and these adorable friends won out to make a non-scary Halloween banner for her door. You likely have everything you need for this cute DIY Halloween decoration. You can use any method to make a pompom, but we like the “wrap it around your finger lots of times” way. It’s easy for kids to do. Wrap white yarn around 4 fingers about 30 times. Slide a 10-inch piece of yarn through the loops (between the yarn and the fingers) and tie in a knot at the top of the bundle. Layout the bundle and tie another piece of white yarn (about 6 inches) about 1/3 of the way down the bundle to form a head. Cut the loops at the bottom of the ghost and glue on black beads for eyes. We used thick black yarn and the same method described above (wrapped about 50 times) to make the base of the spider pompom. I trimmed the pompom into a ball, setting aside 4 strands on each side for the legs. I simply held them so I wouldn’t cut them. 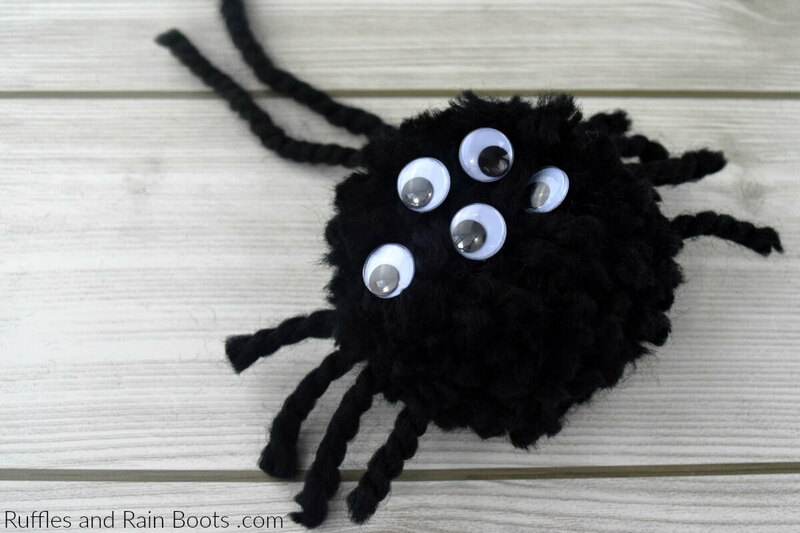 Once I had the legs done, I glued on a few googly eyes and the pompom spider was done. RELATED READING: Make a Felt Halloween Tic-Tac-Toe in Just Minutes! The pompom bat is super-duper cute, right? He’s easy to make, too. Create a black pompom with the method described for the ghost pompom and trim to a puffy circle. Using a piece of black cardstock folded in half, draw a half bat (top of head, ears, and wings). Cut it out, unfold it and attach it to the back of the pompom. 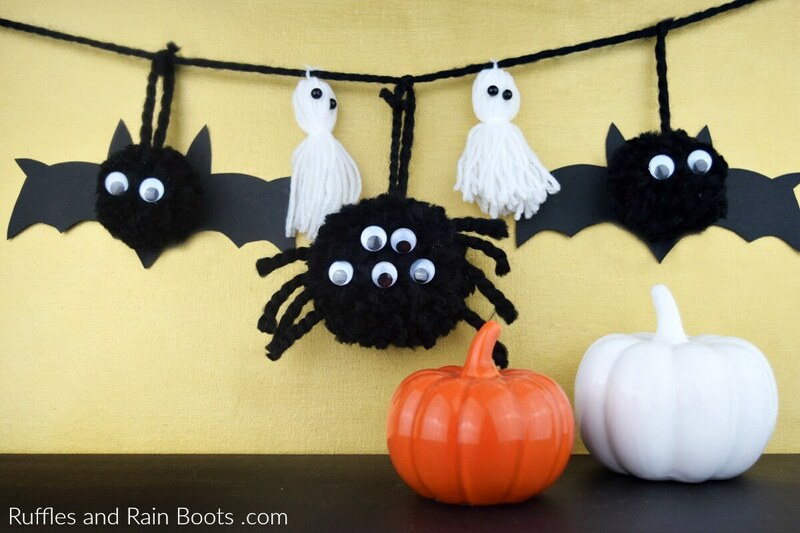 Tie the pompom spider, ghosts, and bats to a piece of black yarn and your fun Halloween pompom banner for kids is done! Let us know in the comments: which is your favorite? I have to say, I’m partial to the pompom spider but my daughter basically swoons over that pompom bat!